If need to show off your Black Knights football pride on College Game day then this Army Black Knights Black Friend Synthetic Polo Shirt from Colosseum Athletics will do that for you. With a standard-fit body made from 7.76 oz. 89/11 Polyester/Spandex Lightweight Training Poly and shoulder inserts constructed from 9.17 oz. 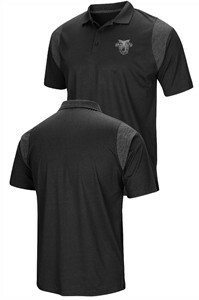 89/11 Polyester/Spandex Poly Span Slub material that helps wick moisture away from your body to help keep you cool this College Golf Shirt also works great on the course or just whenever you want to show your Black Knights team pride. Features include a 3-button placket, color-contrasting shoulder inserts, and a left chest rubberized team graphic.